The Blue Ridge Marble & Granite Company is located in Nelson, Georgia at the former Georgia Marble Company plant. The 200,000 sf. facility is furnished with modern stone fabrication equipment and conveniently located for rail or truck distribution. 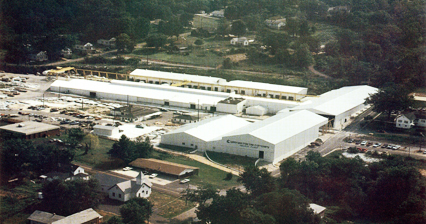 The Blue Ridge Marble & Granite Company plant. Our proximity to the quarry combined with experience and skilled craftsmanship make us the logical choice for all your stone fabrication needs. All of our senior craftsmen have worked most of their lives in the historic marble industry in Georgia. Many of these men have followed in their father’s and grandfather’s footsteps. Character, skill and knowledge have been developed over time and now contribute to the revival of the region and its backbone of stone.